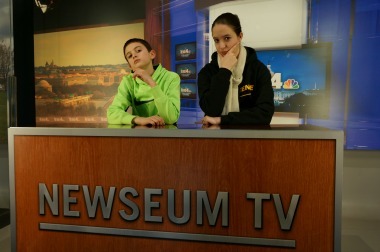 For years, I avoided visiting the Newseum. After all, why pay $22+ per person to visit when so many things in Washington DC are free? 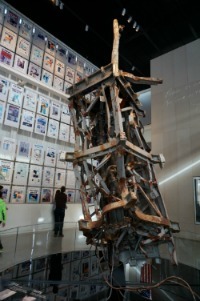 After visiting last year, I learned that whether you're a news-junkie or not, the Newseum is worth the admission fee, although probably best for adults and kids ages 8 and up. It has enough historical and news memorabilia to make you laugh (and possibly shed a tear or two-- more on that later) and enough videos, and interactive, hands-on exhibits to keep the kids happy. Our #1 highlight? Starring in your own newscast, as you can see from my son Alex's video below (just make sure you don't wear green - they don't call it a "green screen" for nothing!). Our kids' favorite: The NBC interactive newsroom which lets YOU actually be the news anchor or play with other hands-on news "toys"
A news history gallery with front pages for historical events throughout history such as the US declaring war on Japan, and wrong but very famous paper with the headline "Dewey Defeats Truman"
In addition, they have gift shops stocked with very books, toys, and news-related items guaranteed to make unique gifts (but quite possibly, blow your budget, although they do have some cheap mementos for the kids). 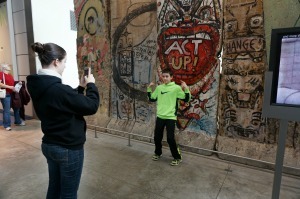 As I mentioned above, there's so much to see at the Newseum that it is hard to do it in only a few hours. You could easily spend the entire day there or take advantage of the second day. Do take advantage of their excellent café or a couple of great, inexpensive restaurants within a block. My favorite lunch, dinner, or snack spot near the museum: Cosi - best-known for their delicious flatbread, they also have amazing sandwiches, soups, smoothies, and yummy desserts that won't break the bank. Save room for their S'Mores which you can roast to perfection at your own tabletop fire pit. Buy a ticket and your next day's visit is FREE! Children ages six and younger are free. Ask at the admissions desk to get discounts for military, college students and AAA members. TIP! The museum frequently offers free admission for kids under 19 during the month of July and sometimes during the month of August. The museum is open daily from 9 AM to 5 PM. It is closed Thanksgiving day, Christmas, and New Year's day. The museum is located at 555 Pennsylvania Ave., NW, Washington DC 20001. Parking is available in nearby garages. I recommend you try Parking Panda to check for available and prices and reserve parking spaces nearby. TIP! Visit on Sundays and parking on the street is free! Although you probably won't be able to find anything during the spring and summer season, you stand a good chance of lucking out in winter. When we last visited, we came on a Sunday in February and were able to park right outside the museum...for free! The museum is very centrally located near all the major sites, not far from the US Capitol building and the White House. They are only a block from the national mall and since they open an hour earlier than the Smithsonian museums it's often best to start your day there, then move to other museums. 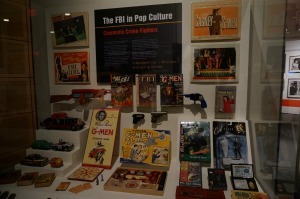 Ford's Theater and the International Spy Museum are only a few blocks away.